Gary Lyndon Felder, 84, of Buxton, NC, passed away peacefully at home on Friday, March 15, 2019. He was in the care and company of his full-time caregiver, Natalie Swindell. Gary died of natural causes. Gary is survived by his son, Brian Felder and wife Denise, and their three children: Mary Esther, John Wallace and Joseph Douglas all of Savannah, GA.
Born in 1934 in Watertown, NY, he was the son of Lorenz and Hulda Felder. He was a career Marine and everyone knew it, without having to ask. He was a Mustang, rising from the rank of enlisted to a commissioned officer. Gary entered the Marine Corps in 1954, retiring in 1974 with the rank of First Lieutenant. 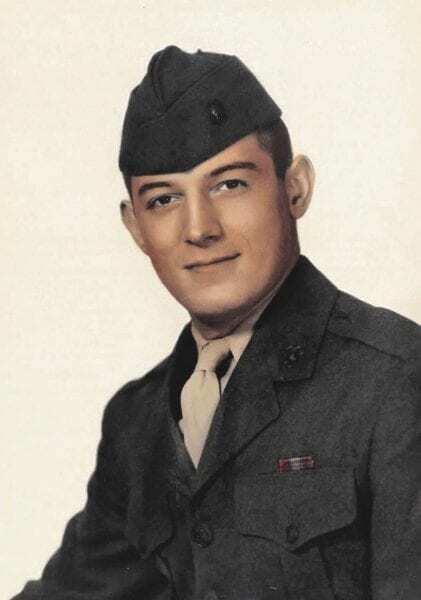 Throughout his life, he was a member and supporter of various Marine Corps organizations, including the Marine Corps League. After the Marines, Gary had a successful career in United States Civil Service acting as a contracts and supply officer. He was a member and officer of the National Contract Managers Association. After retirement, Gary moved to the Outer Banks to care for his ailing mother, Hulda Hodgson, a long-time resident of Buxton. After his mother’s passing, Gary remained and worked several odd jobs, before settling in at Hatteras Light Mini Storage as the manager. He was a member of Little Grove United Methodist Church. A memorial service will be held at 10:00 am on Friday, March 22, 2019, at Little Grove United Methodist Church in Frisco. In lieu of flowers, please give a remembrance to Dare Home Health and Hospice, PO Box 669, Manteo, NC 27954. Hospice nurses assisted Natalie with Gary’s care at the end of his life. Twiford Funeral Home is assisting the family with arrangements. Condolences and memories can be shared at www.TwifordFH.com.